Have you been wondering how you can draw more traffic to your website? Do you want to boost sales or do a better job of promoting your website online but have no idea how to go about it? Are you thinking that the only way to promote your website is through paid ads? 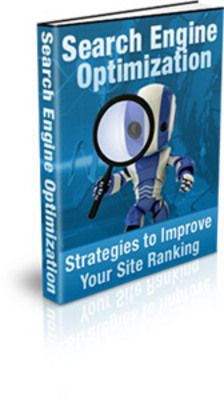 If so, you need to know about Search Engine Optimization and what it can do for you. Search Engine Optimization (SEO) is considered to be the best way to increase traffic to your website. However, most businesses online have no idea what the search engines are or how they can use them to get more customers to their sites. What if someone were to tell you that you can get more traffic to your website - a lot more traffic - simply by using easy to learn SEO strategies? That not only will the traffic be thicker on the website, but that those who follow that traffic will be looking for the products or services that you sell. Would you go for such a marketing plan? And what if someone told you that not only was it easy to use and would provide you with more traffic, but it does not cost "per click" as is the case with pay per click ads? Well, the answer is right here! The Search Engine Optimization report not only tells you how to make the most of your website marketing by using SEO strategies in how to market the site yourself. You can learn everything you need to know about search engine optimization from this report that gives you step by step instructions on how you can improve the site and start bringing in more traffic right away. If you are looking for a way to get more customers to your website, this will teach you how to get those customers with little or no cost to you! 1.) Learn how to decide which are the best keywords! Even if you have never done any internet marketing, you can learn how to market your website right away by learning about keywords and how to use them. This book teaches you how to get the best keywords for your site and how to use them in your text, video and pictures to make the most of your site! 2.) Learn how to use different SEO marketing strategies! Not only will you be able to figure out which keywords to use and where to use them from this report, but you will also learn how you can use text and other materials to raise your rankings in the search engines and bring more traffic to your website. And teaches you how to use free marketing sites online to give your website the most exposure! For only $17, you can download a copy of Search Engine Optimization right away and start learning the secrets that few people know when it comes to promoting your website so that it gets spread all over the web! This report not only offers advice on how to get SEO started and how you can do this on your own, but it also tells you what you need to know to keep your site ranking high in the search engines. You can start right away in building up your site so that you start to see an improvement in traffic right away! This guide is not marketed towards the rich or the poor, it is marketed for anyone who wants to be able to better understand SEO.